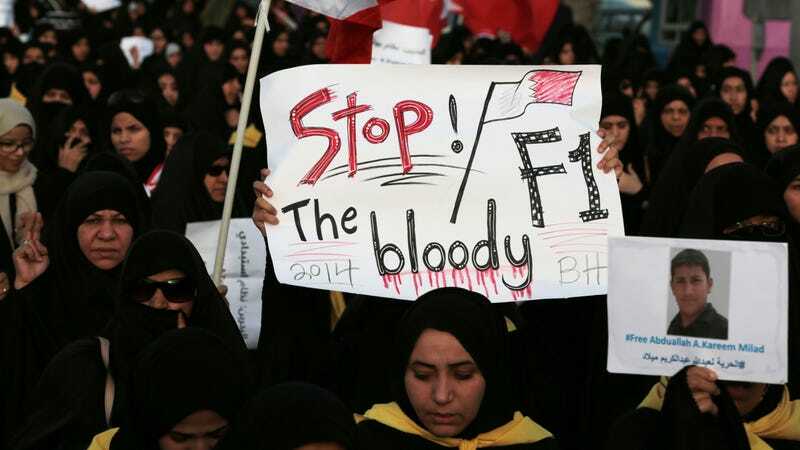 Protestors of the 2014 Formula One Bahrain Grand Prix in Saar, Bahrain. Formula One’s leaders finally admitted they’re “concerned” that a woman protesting the Bahrain Grand Prix on Facebook got thrown in jail for three years, the Guardian reports. It’s an acknowledgment from the series’ new owners that people do suffer outside of race-track walls, no matter how much past owners tried to ignore their politics and controversy. F1 runs roughly 20 races worldwide each year, bringing one of the top tiers of motorsport (we’ll call it the pinnacle after F1 races on an oval) to tracks and street circuits around the world. But not all of its destinations are without notable controversy and human rights disputes, like the series’ current annual trips to Azerbaijan and Bahrain, not to mention its history of racing in Apartheid South Africa. The recent Guardian report is about the arrest of activist Najah Yusuf, jailed for three years after a series of Facebook posts in April of 2017 “critical of the race and the regime” amid F1 visiting Bahrain International Circuit in Sakhir, the story said. That regime is of the al-Khalifa family, which the New York Times wrote in a 2015 story is of Sunni origin and has ruled Bahrain since the 18th century. Shiites grew to the the majority of the population in recent decades, the Times wrote, wanting equal social treatment with the Sunnis. A demonstrator was killed by security forces during the protests, but there was no violence at the race track or in central Manama, where most of the sports journalists were staying. Several members of the Force India team were caught in a hail of Molotov cocktails while driving back to the city from the track, but no one was injured. In the court judgment against her it was noted that she had written “No to Formula races on occupied Bahraini land” and claimed that F1 coming to her country was “nothing more than a way for the [ruling] al-Khalifa family to whitewash their criminal record and gross human rights violations”. She also called for a “Freedom for the Formula Detainees” march to put the spotlight on protestors jailed for criticising the Bahrain Grand Prix. A week later Najah was arrested. During her interrogation she claims she was beaten with shoes, groped and sexually assaulted. She also alleges that she was repeatedly asked: “How many times have boys ridden you?” before her questioner threatened to “ride” her several times. There was no lawyer present and Najah says she was subsequently coerced into signing a pre-prepared confession which led to her being jailed in June. The Bahrain government said Yusuf was jailed for “promoting and encouraging people to overthrow the political and social systems,” the Guardian said. The Guardian has far more on Yusuf in the context of the Bahrain Grand Prix protests here, and the reporting is worth the read. Yusuf’s story is part of a bigger issue with F1’s visits to oppressive countries with poor records in terms of human rights, and the apparent bubble F1 puts itself in when it visits the countries. Bahrain most certainly uses the race for good PR about the country. When F1 added a street race in the Azerbaijan capital city of Baku to its calendar a few years ago, human-rights groups stood against F1 and urged the series and the FIA not to go. Baku and Bahrain were on the calendar this year, with F1 visiting both in April. The New York Times wrote in 2015 about the year the Bahrain Grand Prix was canceled amid protests and forceful government response that led to bloodshed, 2011, and how things went on as usual the next year. That was despite tens of thousands of people protesting on a major highway to demand the race be canceled that year, according to the Guardian. Despite public calls from British politicians, human rights groups and other organizations around the world to cancel the race, Formula One remained adamant that the show would go on. “I can’t call this race off,” said Bernie Ecclestone, the series’s promoter. F1 is under new owners as of 2016 who haven’t agreed with how the old reign approached a number of things, but so far, that’s involved different approaches to promotion, media, and grid girls. Nothing has gravely changed in F1's dealings with dictatorships. Perhaps this move to acknowledge Yusuf’s experiences and claims, while it isn’t much, is a move toward an F1 that could eventually learn from the transgressions it’s so easily made in the past.